A file with the EDRW file extension is an eDrawings file used with the SolidWorks eDrawings CAD program. In short, it's just a format used for storing 3D designs in a "view only" format. EDRW files are useful when sharing a design not only because the file is compacted to a much smaller size than the raw design, making them much easier to share, but also because the original data can't be tampered with because the format is specially made for viewing a design but not editing it. Even more, drawings in an EDRW file can be examined without the recipient needing a full, bulky CAD program installed. EDRWX files are similar to EDRW files but have been created in the XPS format. SolidWorks eDrawings Viewer is a free CAD tool that can open and animate drawings in the EDRW format. This program can even protect the EDRW file with a password. Be sure to click on the FREE CAD TOOLS tab on the right side of that page we just linked to for the eDrawings download link. eDrawings Viewer supports other eDrawings file formats too, like EASM, EASMX, EPRT, EPRTX, and EDRWX. The eDrawingsViewer.com website has download links for eDrawings Publisher plugins that you can use with 3D design programs like CATIA, Autodesk Inventor, Solid Edge, and SketchUp. The plugins enable those programs to export drawings to the EDRW format. If you still can't open your file, double-check that you're not misreading the file extension. It's easy to confuse other formats that share similar letters, like DRW (DESIGNER Drawing) and WER (Windows Error Report), with the EDRW eDrawings format. If you find that an application on your PC does try to open the EDRW guide to learn how to make that change in Windows. If you download the eDrawings Viewer program from the SolidWorks link above, you can save the EDRW file to BMP, TIF, JPG, PNG, GIF, and HTM. 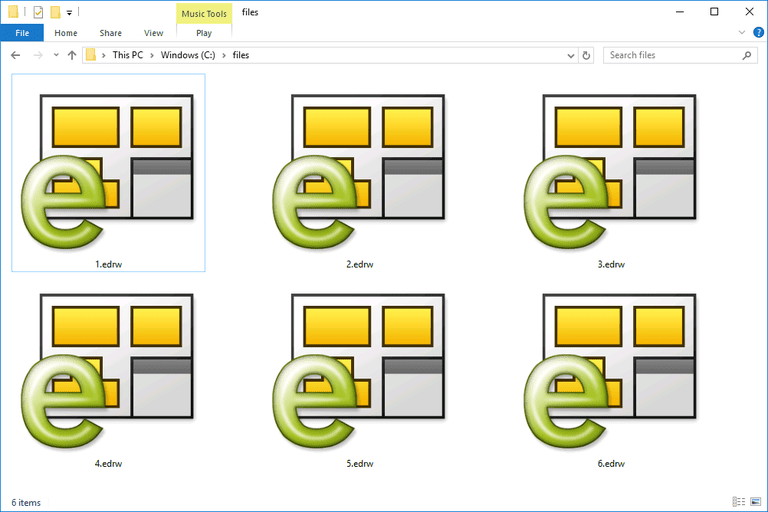 The same program can convert the EDRW file to an EXE file (or even a ZIP with the EXE automatically saved inside) so it can be opened on a computer that doesn't have the eDrawings software installed. You're also able to convert EDRW to PDF with a tool called "PDF printer." We're not aware of any file converters that can convert EDRW to DWG or DXF, which are two other CAD file formats. However, even with a conversion tool that supports getting the EDRW file into one of those formats, all it would let you do is view the 3D image, not edit it, since it's really just a viewing format.